*See Webb, Joe and Pryor, Terell. A homecoming for Schwartz and Vandenbosh. Stafford looks like a world beater again. 300 yards & 3 TDs (2 to Calvin). This game comes at the perfect time. This is about as sure of a road victory as we'll have this year. I don't really agree that the Lions did well against Cam last year. The Lions had to stage a comeback in that game to pull it out. The Lions gave up 35 points to Carolina just a week after the Titans held the Panthers to just three points. Cam threw for 280 yards and a TD. He also ran in two scores. I wouldn't call that doing well against him. YAYY I'm roadtripping to this game, 10 1/2 hour drive to Nashville. The Lions better win or ill hear it from my Titans fan roommate forever. Also the Lions owe me for having to watch Kitna beat Hill at Jerry's World the last Lions game I went to a couple years ago. Chris Houston says he’s had enough of watching games from the sidelines. The sixth-year Lions cornerback says it’s about time he starts contributing, and says that begins Sunday in Tennessee. Houston was limited all three practices last week leading up to the 49ers game. The team’s starting left cornerback hasn’t played the first two weeks of the season after suffering a high ankle sprain in the third preseason game against the Raiders. The Lions’ most experienced corner, Houston led them with five interceptions last season. His two touchdown returns were tied for the most in the NFL. He’s a playmaker in the secondary and the Lions could use a little bit of that having yet to record an interception yet this season. Lions cornerback Drayton Florence had surgery to repair a broken forearm suffered in Sunday’s loss to the 49ers. “To tell you how tough he is, it happened in the third quarter and he played the rest of the game,” Lions head coach Jim Schwartz said Wednesday. “I have a lot of respect for that guy. He’s played a lot of football in the NFL; came in here and learned the system very quickly and got thrown into the fire very quickly. I thought he acquainted himself very well and the team needed him. Later in the day, the Lions officially designated Florence as Reserve/Injured with the eligiblity to return. The new rule allows a player to practice after six weeks and then come off the list two weeks later and still play during the season. Before is a player was placed on Reserve/Injured he was lost for the season. Besides getting Houston back on the practice field Wednesday, cornerback Bill Bentley and running back Mikel Leshoure were also participants. Bentley, who chose not to speak to the media until Thursday, was limited in his first practice since sustaining a concussion against the Rams in Week 1. Thursday will be an important day for Bentley to see if he remains symptom-free after returning to practice for the first time on Wednesday. Leshoure, who was suspended the first two weeks of the season, split carries with Kevin Smith and the first-team offense in the portion of practice open to the media. 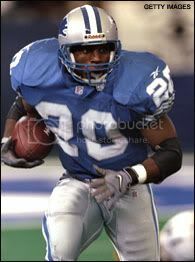 Not practicing for the Lions were: safety Louis Delmas (knee), cornerback Drayton Florence (forearm), receiver Calvin Johnson (ankle), linebacker Travis Lewis (quad), tight end Tony Scheffler (calf) and defensive tackle Corey Williams (knee). The ankle injury is new for Johnson. He didn’t practice on Wednesday last week because of a foot injury. Former Lions offensive coordinator Mike Martz is the color analyst for Sunday’s Lions game in Tennessee. Martz was the Lions’ offensive coordinator in 2006 and 2007. So how would Martz have reacted to the Lions running the ball 26 times vs. 49ers? Titans head coach Mike Munchak knew Matthew Stafford was going to be a good NFL quarterback all the way back to Stafford’s college days at Georgia. You see, Munchak had two daughters who went to Georgia the same time Stafford was there and told the Detroit media Wednesday that he got plenty of live scouting on him during that time. “My daughters went to Georgia so I’ve always liked him,” he said. “I got to see him play a lot in college and I think he’s a special player. Cornerback Jerome Murphy began the process Wednesday of learning his third different defensive scheme this season. The Lions claimed Murphy off waivers on Tuesday and released cornerback Kevin Barnes to make room for him on the 53-man roster. Murphy practiced for the first time as a Lion Wednesday. Already this season, Murphy has been with the Rams (preseason), Saints (first two regular season games) and now the Lions. Can't wait to see what Mikel can do. Sux that Delmas (*cough* Sanders) is still not practicing. Wouldn't image the Leo's scheme is that much different from Fisher's, right? NFL Redzone flashed to the N.O. game a lot last week and Martz was in the booth for it. My buddy and I were both convinced that Martz was flat out DRUNK. He was slurring his words, made statements like Madden did the year before he retired, and generallly made me laugh hard without intending to. Im interested to see if he WAS drunk, of if thats just how he is now. Lions will figure a way to let them in the game, they're like Poppa Grande, six run leads are not safe. Lions dont need to do much to win this game. It wont be that fun of a game to watch unless Locker starts turning it over because the Lions can win it easily with a conservative game plan. I expect a lot of short passes to Smith and WR screens to Burleson to get Stafford in rhythm. I hope to finally see Broyles play some as Scheffler is out. He will need to prove that he is a better mismatch than Scheffler. We ll see what the game plan is with LeShoure as well, he was late for his first practice after his suspension so who knows. Physically he looks ok which is huge bc of the terrible injury he had but I there seem to more issues with this guy that could affect playing time. Defensively we need to blow up there OL which shouldnt be a problem. Chris Johnson will make some guys miss but ultimately the Titans will have to throw in this game to have a chance and they ve shown up to this point that there QB isnt up to that task. I think this will be the game that the Lions finally put a full game together. Everyone is going to be scared of Detroit after this one.